The team of quality auditors, that we have, strictly checks the entire production process for ensuring zero defects at buyer's end. We are specialist in making available Akarkara Plants(Anacyclus pyrethrum) in a wide spectrum of grades and specifications. Akarkara (Spilanthes Acmella) is a valuable gift from the nature to living being. Akarkara fresh or dry (Panchang) is used in manufacture of many ayurvedic, Homoeopathic, unanai, and alopathic medicines. AKARKARA has natural oil, which is good source for health. 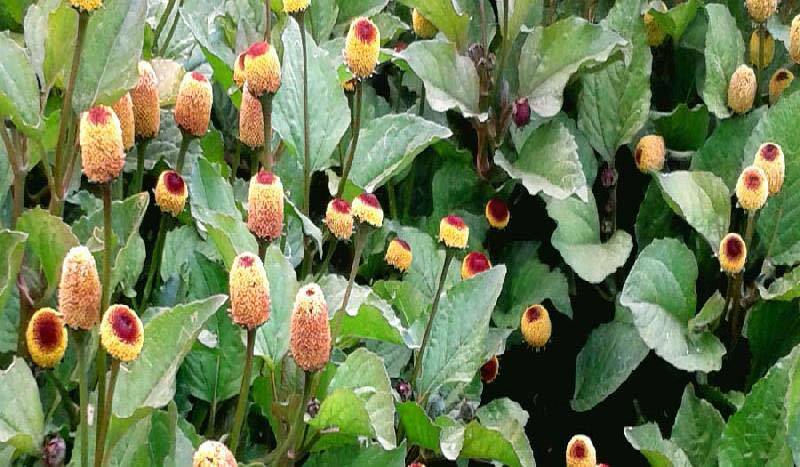 Akarkara (Spilanthes Acmella) is also known as Acmella oleracea is a unique and versatile herbal plant and also known as anti-toothache plant with high medicinal usages So, it has been recognized as an important medicinal plant. Due to its traditional uses in health care and as food, now-a-days, there is an increasingly demand all over the world. Akarkara flowers begin with thick red stuff; they increasingly stretch and turn yellow, keeping the red on the top. Naturally leaves are dark green and the stems, leaf stalks and veins dark green with light-purple colour. It can be an easily grown plant with a spreading and bringing up the rear habit. Akarkara (Spilanthes Acmella) is native to Brazil and Africa. It is an annual herb with Flower, Leaf and Root is non-toxic and has similar properties. To chew a fresh bud of Akarkara, Get your friends to try it, it is an experience everyone should enjoy. Within a few seconds, your mouth will start producing large amounts of saliva, followed by a very intense tingling and numbing effect. It disinfects and stimulates every inch of yours mouth. The plants have long been used in India for the treatment of gum and dental problems. The flowers and roots are the strongest part of the plant. Flowers and leaves are used by Ayurved Doctor (Vaid) to improve the immune system, improve digestion, help in hiccough & nausea. Akarkara (Spilanthes Acmella) grows naturally in most parts of India, as per practical experience it can grow successfully in the specific range of temperature and rainfall. Good soil with proper drainage system facilitates its growth. We at Vedant Herbal Farm provide consultancy and training for cultivating Akarkara (Spilanthes Acmella) to our customers. The preparation of Land : The Land is to be prepared in the month of May-June. Proper Soil treatment including give land a better Pulverize and drying. Cow dung manure should be mixed. The distance of beds is depending on irrigation systems. Sowing of Akarkara : The sowing of Akarkara starts in month of August. Required element should be supplied. Any kind of deficiency should be traced and treat it immediately. Weeds of the crop are required to free it from the weeds, which should be controlled manually by labours. Few special techniques practiced to be observed either by training or by frequently visiting. The first three to four months from the sowing date are very important and needs care. Flower - Flowering is started after the two to three month of showing and collect mature flower. After the two to three month of showing of Akarkara plant start flowering then take mature flower buds gently. Fresh flower buds are yellow in colour with red top. After the starting of flowering plant produce number of flowers and take it periodically. After that dry it properly through proper procedure. After The crop cycle is complete root should bedug out and dry it. Plant Annual erect or ascending stout herbs, 20-50 cm high. Annual erect or ascending herbs, 15-40 cm high. Leaves Opposite, petiolate, broadly ovate, narrowed at base, acute or obtuse at apex. opposite, petioled, ovate, acute, subcrenate at margins. Heads In axillary and terminal panicles; Involucral bracts 2-seriate; Ray florets few, in conspicuous; Disc florets companulate, Achenes dorsally compressed, black. Ovoid, usually solitary; Involucral bracts ovate, acute; Ray florets absent; Disc-florets yellow; Achenes dark brown. Flowering and Fruits March-April. November to December.